I am hoping to see if there is interest in founding a Collegium dedicated to the construction of a modern temple and physical altars dedicated to all the Gods and Godddesses of Rome. This project would raise funds and explore options for constructing a physical temple and altars in the near future. Is anyone interested in helping draft our objectives and bylaws? I can't do this alone! As discussed privately, I am honored to help with this project. Here is the logo you requested. Let me know if you desire any changes. 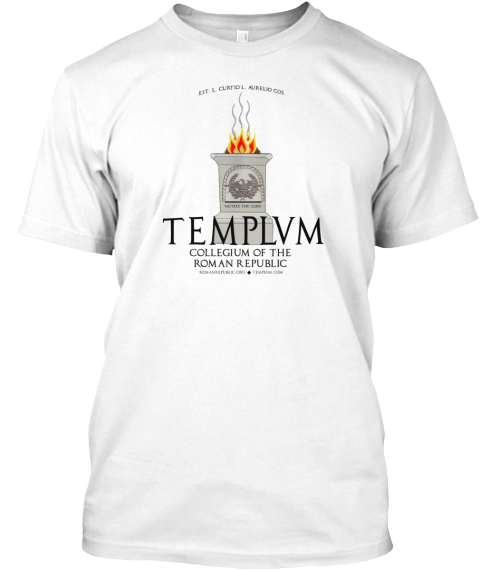 All funds will help support the Roman Republic and TEMPLVM. Valeria, I set up the web address you requested templvm.com. This is a great idea! I liked the concept of Cassia Longina's Roma Aeterna Facebook group to build a temple, but this whole group was born out of intolerance and hatred and still cannot overcome it. It is not blessed by Concordia, and without the blessings of the gods no temple can be built. If Cassia was wise, she would join this TEMPLVM COLLEGIVM and support our common goal. Only such a collegium under the umbrella of our Republic will be able to make the temple a reality. Gratias tibi, Valeria Messalla! This was the right thing to do at the right moment. BTW Collegium Aedis Deorum would probably be a better Latin name for the Collegium. A templum was a sacred place in Latin, it does not mean the actual building on top of it. This was called aedes, e. g. Aedes Iovis Optimi Maximi Capitolini for the Iuppiter temple in Rome. Considering my last post about the difference between templum and aedes, the word “templum” was probably well chosen. Because our temple needs to be more than just a building. It needs to be a sacred space. Cassia Longina understood quite well that this temple needs some life, it cannot work as an empty stone construction. Unfortunately she made the poor choice to build it in the U.S., where I doubt that this will be possible for anything else than a small local group. The rooms in the upper floor (hospitium) should offer an economic place to stay for people doing a kind of pilgrimage to Rome. The ground floor and parts of the garden can be used as restaurant (caupona) at night, for seminars and study at daytime. The same room can also contain a library. Courses about the Cultus Deorum and Roman history as well as immersive Latin classes could be conducted there. Each course should be one or two weeks. Ordination and recognition as sacerdos should require attending the ceremony in the temple facility after approval by the corresponding priesthood. The aedes should have daily ceremonies in the morning and evening, additional ceremonies during Roman festivals. The main building needs two separate tabernae on the ground floor, one as reception for the hospitium and as travel agency (operated by the Collegium Peregrinatorum), the other one to sell Roman clothes and other merchandize of our Republic. The Collegium Peregrinatorum would offer group trips with different focus (practice of Cultus Deorum, ordination ceremony for sacerdotes, study of Roman history and architecture, Roman cuisine etc.) Each group would be 10 to 20 people. If enough participants are found, a definite reservation is done. Two separate groups could be present at the templum at any time. It is imperative that it will be in Rome. It does not necessarily need to be within the Aurelian Wall of course, but somewhere close to the city and in walking distance from public transportation. Naples or Sorrento would be the only possible alternatives, since they are close to Pompeii, which would also allow a program of historical sight seeing and attract tourists interested in Rome. It is obvious that this is a commercial operation and requires funds that cannot be provided by donations. So we do not need to waste time collecting money. This would be a serious investment. One option would be approaching an already existing hotel, setting up a new business concept with them according to the plan above and get a travel agency and a souvenir shop involved. The operation would sell shares to the investors. The independence of the flamines and sacerdotes of the temple would need to be negotiated, but the Republic and our magistrates would only have advisory function in the project, which would be operated by the investors. For this project to succeed, we need a solid business plan, a cooperation with the Tribus Ramnes of the Communitas Populi Romani and representatives (Custos or Praefectus Urbanus) of our Republic who live permanently in Italy. This project would be unique in the world and attractive for everybody, not just the citizens of our Republic. We would certainly get a lot of publicity and could work together with the Italian Ministero dei Beni e delle Attività Culturali e del Turismo – MiBAC. We could have people walk around in traditional tunicae and togae within the facilities and the garden area. This would be fun for any kind of tourists. This is my vision for the project. What do you think? Gaius Florius Lupus wrote: Salvete! I love this vision as a long term end goal. We want the same thing. What I want to focus on is getting us from where we are now to the end vision you describe. How to we get there? 1. The RR is a powerful support system for this vision. It has people, resources and the ability to organize people and mediate inevitable disagreements. It also is a means to collectively manage finances. We need all these things. The Collegium will allow a subset of our population interested in temple and altar construction to focus only on this task. So what do we need to do? We need to draw up some bylaws for the TEMPLVM Collegium. In general I think the leadership of the collegium should consist of the two required co-leaders who are elected. I also think other stakeholders from the RR should be included as vice-leaders. One from the senate representing the elected leadership of the community, one from the Comitia Curiata representing the corporation assisting with storage of finances at the present, and one Sacerdos who can represent the spiritual expertise in our community. These vice-leaders would be invited for a one year term by the two co-leaders. 2. First the collegium should focus on outdoor altars. These were much more common than temples historically. They can serve many of the same basic functions as a physical building. Such a place allows a foci of community worship. It requires the acquisition of land and the basic construction of a much more simple altar. Such experiences would assist in the larger goal of building a temple. So what do we need to do at this step? We need to raise funds and promote education in the CDR. The RR has helped a lot with this. I thought I knew a lot about the CDR one year ago. Now after lessons from citizens here in the RR I see that I knew little. Education expands the CDR and community. The altars and temples require communities to be successful. Communities lead to funds which enable construction of altars and temples. We must focus here first. Raising funds, and expanding communities. I think the RR can really help on these points. 3. Once we have achieved 1 and 2 we are ready to build a temple. We will have experience creating several altars. There should be several communities based around these altars. We will have funds and a growing CDR. Based on these things we should know where and how to proceed with the temple construction. We should contact the temple in Sarmatia to see if they have advice and resource contacts. Then we should move forward and build a temple much like described by good Lupus. Who will join me in drafting our bylaws for we can get goal #1 out of the way? I'm excited to get started on goal #2! Here are my proposed bylaws. Valeria these are very similar to the ones shared earlier by PM. I only made stylistic changes. a. To assist in the establishment and maintenance of physical altars to serve as public places to honor the Gods and Goddesses of Rome. b. To assist in the establishment and maintenance of physical temple buildings to serve as public places to honor the Gods and Goddesses of Rome. e. To uphold the principles of the Declaration of the Roman Republic in all work outlined in the objectives. I. The Collegium will have two co-leaders called magistri. They are elected for the sole purpose of coordinating meetings of the Collegium. The magistri each have one vote on the board (Schola). Magistri must be members of the Collegium to stand for election. II. Magistri will be elected by the membership of the Collegium. Whatever two candidates receive the greatest number of votes will be elected. If there is a tie the citizen with the lowest citizen ID is elected. III. If no candidate can be found to fill a magister position then the leadership of the Collegium defaults to the most senior Curule Aedile of the Roman Republic until the position can be filled. IV. The term of a magister is one year. V. Any magister can veto the actions of their magister or decuriones colleague. The results of a vote of the schola or membership cannot be vetoed. I. Three decuriones are to be selected by consensus of the magistri. They are to become members of the Collegium upon selection if not already. They are to assist with organizing the affairs of the Collegium. The decuriones each have one vote on the board (Schola). The decuriones must consent to the position in writing. II. One decurio should be a recognized sacerdos of the Roman Republic or member of the Collegium Pontificum or Collegium Augurum. III. One decurio should be a current Senator of the Roman Republic. IV. One decurio should be a well respected and active citizen of the Roman Republic. V. If a decurio position cannot be filled then the most senior available Curule Aedile shall be asked to temporarily hold the position. If no Curule Aedile is available the most senior available Plebeian Aedile shall be asked to temporarily hold the position. VI. A term for a decurio lasts one year. VII. Any decurio can veto the actions of their decurio colleague. The results of a vote of the schola or membership cannot be vetoed. I. Meetings of the magistri and decuriones are called meetings of the Schola. Any magistri or decuriones may call a meeting. II. Quorum is one magister, and at least two decurio. III. Meetings may be held electronically. IV. The approval of all Collegium activities requires a majority vote of the Schola. V. All meetings of the Schola must be public. VI. In the event of a tie the magister present with the lowest citizen ID number breaks the tie. I. Elections of the membership are to occur for two reasons. To elect magistri or change the bylaws. II. Ballots must be accepted for a minimum of 14 days and maximum of 21 days. III. All registered members of the collegium receive one vote in these elections. IV. The aediles or quaestores of the Roman Republic will be asked to monitor these elections independently. The aediles will resolve any disputes in an election. The Collegium is to accept the resolution of the aediles in these matters. VI. The bylaws can only be changed with 2/3 support of ballots cast in an election. VII. Any decuriones or magistri may call an election. I. Members may be removed by 2/3 support of a vote of the Schola. II. Removed members may appeal to the Praetores, the Collegium must accept the final decision of the Praetores regarding removal. I. All denarii funds will be held in the collegium account of the Collegium. Transfers are authorized by majority support of the Schola. II. All USD funds raised are to be held in trust to the Roman Republic Non-Profit Corporation. I. The Collegium may be dissolved by decision of the membership to amend the bylaws to nullify the Collegium. II. If the Collegium is dissolved all funds in denarii are to be donated equally between the Collegium Pontificum and Collegium Augurum. If neither group exists the funds are to be donated to the Senate of the Roman Republic. III. All USD funds are to be donated to the Roman Republic Non-Profit Corporation. I am not sure, if a small altar can ever grow into the project I described. Growing will not work for something of this magnitude. We need to approach an already existing hotel/restaurant operation, present a business model, contact the tourism minisry and then build the temple on the land there. So the first step is establishing a presence in Rome, contacting the tribus Ramnes of the CPR and grow our comunity to convince investors that there is a global market for this full-immersion experience into ancient Rome. On the other hand an outdoors altar is cheap. It could be the first meeting point for a permanent community that meets regulary. And this is what means "establishing a presence" there. We just have to keep in mind that the temple will probably not be built around it, but somewhere else. So yes, the temple will probably not grow out of this altar, but it might be a necessary step for consolidating a community. By the way, is there any citizen among us who belongs to the tribus Ramnes of the CPR? L. Horatia Adamas C. Florio Lupo C. Cominio Laenati Proculae Valeriae Messallinae omnibusque S.P.D. This sounds quite interesting, but I feel compelled to point out that a) there are several cultores in North America, b) that there already is a Roman-based B&B in Rome, and c) that the Italian authorities are not likely to welcome any religious edifice other than a Christian church, though possibly Jewish synagogues might be permitted. Other groups have run into brick walls on that one. The group in Sarmatia seems to have had better luck, but that, too, may not last.